this film is based on the personal diaries of Ernest Thompson Seton himself. wild creatures is in itself a precious heritage that we have no right to destroy or put beyond the reach of our children." dangerous outlaw. Feared by ranchers throughout the region, the outlaw wasn’t a pistol-packing cowboy or train-robbing bandit. movement in America: Wilderness Preservation. (1.) Ground work set for an epic duel: Seton arrives in New Mexico with a plan. (2.) Seton underestimates Lobo's astuteness: After many failed attempts at trapping him, Seton starts to realize how really clever Lobo is. (3.) The Seton paradox: avid naturalist vs. unsentimental hunter: Seton has a break-through, which could lead him to Lobo. (5.) Seton's renewed view of the value of the wild helps turn the tide. Seton founds the Woodcraft Indians, and the Boy Scouts of America. See also: lots of user comments on each page, about the program, some with other links. 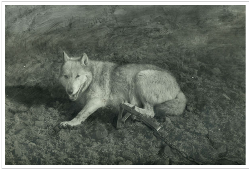 LOBO THE KING OF CURRUMPAW in MS Word .doc or as a .pdf file with original Seton photos and drawings. Printer ready file! IWGBTP! 87714 IWGBTP! 87714 IWGBTP! 87714 IWGBTP! 87714 IWGBTP! 87714 IWGBTP! 87714 IWGBTP! whose despotic power was felt over its entire extent was an old gray wolf. was cunning and strong in proportion to his size. His voice at night was well-known and easily distinguished from that of any of his fellows. serious inroads had been made among the herds. swiftness, which, according to current stories had, on several occasions, captured an antelope for the pack. known, they selected the best in every instance. disdained, and though they occasionally took a young calf or colt, it was quite clear that veal or horseflesh was not their favorite diet. 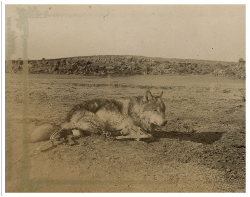 1893, Blanca and the yellow wolf killed two hundred and fifty sheep, apparently for the fun of it, and did not eat an ounce of their flesh. and the keenness of his scent to detect the taint of human hands or the poison itself, completed their immunity. parts that had been poisoned. 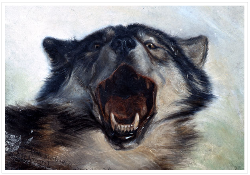 a wolf, and now he never doubted that, within a few days, old Lobo’s scalp would dangle at his saddle-bow. back to Texas, leaving Lobo more than ever the despot of the region. traps were the only available expedients. At present we had no traps large enough, so I set to work with poison. circuit, dropping a bait at each quarter of a mile, taking the utmost care, always, not to touch any with my hands. base of Sierra Grande. This was Monday, and that same evening, as we were about to retire, I heard the deep bass howl of his majesty. about it, and finally had picked it up. his business with the pack he guarded so effectively. weakness, namely, to follow their leader. And this the shepherds turn to good account by putting half a dozen goats in the flock of sheep. usually are thus saved from a stampede and are easily protected. But it was not always so. being neither fools nor cowards, stood their ground and were bravely defiant; but alas for them, no common wolf was heading this attack. he stopped and turned aside as soon as he detected suspicious signs on the trail and a new plan to outwit him at once suggested itself. I set the traps in the form of an H; that is, with a row of traps on each side of the trail, and one on the trail for the cross-bar of the H.
fallen through the indiscretion of a trusted ally. until a cowboy made a remark which explained the matter. the dust I brushed the place over with the skin of a coyote, and with a foot of the same animal made a number of tracks over the traps. traps, fastening them to the head itself. though it had been thrown aside as useless. wolf, had evidently gone on to examine the head as it lay apart and had walked right into one of the traps. ever seen. Her coat was in perfect condition and nearly white. to inflict on the Currumpaw pack. what had taken place, for her blood had stained the place of her death. that he had indeed fallen into one of these, but such was his strength, he had torn himself loose and cast it aside. killing Blanca, for by using her as a decoy I might have secured him the next night. and device known to me I used, and retired at a late hour to await the result. loss of blood, and he soon sank exhausted to the ground. Something like compunction came over me, as I prepared to deal out to him that which so many had suffered at his hands. lassoes whistled through the air and tightened on his neck. me at last, do as you please with me.” And from that time he took no more notice of us. descended the pathway into the cañon, and the rocks cut off the view. the leader of Tannerey’s wolf-hounds—a mark which she gave him the moment before he stretched her lifeless on the sand of the cañon. he had called once in his extremity, and none had come; he would never call again. there still in his position of calm repose, but his spirit was gone—the old king-wolf was dead. with the photos that Seton himself took. site/blog for purposes of your own that go beyond 'fair use', you must obtain permission from the copyright owner. with guns, he knew he was powerless. head caught in the rocks and held her. Then she had to turn and face us. 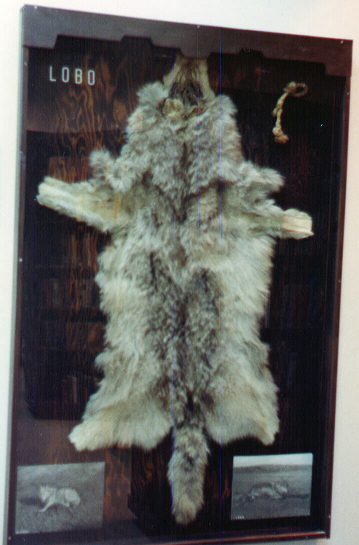 was trapped on January 31, 1894.
exemplifies Seton’s interest in Lobo. photograph. This is the event. NOTE: Corrumpa is the current spelling of the name, it's in Union County, NM. Some interesting self guided historical and scenic tours around the Cimarron area. Glimpse the pioneer experience of nineteenth century America along this national and historic byway. system and the Boy Scout movement in America. See more of Seton's photos and art.